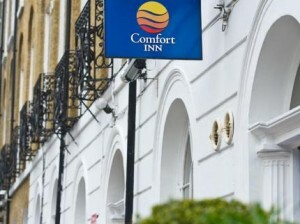 Comfort Inn Kings Cross to St. Pancras Hotel is located right in the center of London, on Saint Chads Street, and as its name says, is just a few minutes walking to Saint Pancras Station and also to Kings Cross. The London Heathrow Airport, London Gatwick Airport and London Stansted Airport are located within driving distance. Even though it has such a good location, the hotel is very comfortable and has quite low and affordable prices which include many facilities, such as: air conditioning, LCD television, safety deposit boxes, free wireless in all the rooms, 24/7 front desk team service, complimentary breakfast every day and many other facilities. Nearby the hotel you can manage to find some of the biggest attractions that are to be found in the City of London. If you will stay at this hotel, you will have the chance to visit historical buildings, shopping streets, park, etc. If you love to explore the beauty of the surrounding nature, you will be happy to see that you can easily reach places like Hyde Park, Kew Gardens, Covent Garden and London Zoo. Also, you get the chance to visit historical places like The Buckingham Palace, Tower of London, Tower Bridge, the London Eye, St. Paul’s Cathedral or Westminster Abbey. If you like shopping, you can easily find places crowded with shops, such as the Oxford Street or Camden Lock Market. In order to get rail transport from London Heathrow Airport to Comfort Inn Kings Cross Hotel, you need to take the train from Heathrow Terminal 1 to Paddington. The train comes every 15 minutes and the total journey takes about 17 minutes. If you want to travel by car from London Heathrow Airport to Comfort Inn Kings Cross, you have to take the A30 first, then the Great West Road/A4, the A40 and then the Gunnersbury Avenue. After a few minutes of driving through the A40 and the Euston Road, you will find yourself close by the hotel. 247 Heathrow Airport Transfer can always provide you with a minicab from London Heathrow Airport toÂ Comfort Inn Kings Cross. The price for a Saloon car is £42 and the journey can take up to one hour if we include any traffic delays that may occur in rush hour time.